Flying Across Britain With Arthur Williams is a TV show on British national television from Channel 4 with an average rating of 3.5 stars by TelevisionCatchUp.co.uk's visitors. We have 4 episodes of Flying Across Britain With Arthur Williams in our archive. 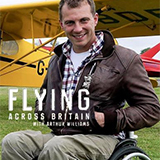 The first episode of Flying Across Britain With Arthur Williams was broadcast in August, 2018. Did you miss an episode of Flying Across Britain With Arthur Williams but don't you wan't that to happen in the future? Please set an alarm and add Flying Across Britain With Arthur Williams to your favourites, so we can remind you by email when there's a new episode available to watch. For free! Arthur's flies over England's east coast, and visits four airfields that played a role in World War Two. He also joins an aerial aerobatics team. Arthur negotiates London's busy airspace. He flies over Sheppey and the M25 and takes a Spitfire out for a spin over the Kent countryside.